Hôtel Paris Bastille Boutet – MGallery by Sofitel derives its name from a historic Parisian company named Maison Boutet. At the beginning of the 20th century, Maison Boutet was a prosperous business that manufactured and distributed exotic wood to the craftsmen living throughout the surrounding area. The company’s officers decided to raise a new building to stay abreast of business’s growth. Finished in 1926, the building was a factory for the next 63 years. Yet, by the 1980s, all manufacturing had ceased. A team led by Vincent Bastie and Astrid Dieterlen restored the erstwhile factory to its former glory. With its pristine accommodations and charming facilities, Hôtel Paris Bastille Boutet is a delightful getaway in the center of Paris. Designed by the talented Bruno Borrione, the Hôtel Paris Bastille Boutet features 80 beautifully refurbished guestrooms and suites. Guests will find many splendid amenities located inside, including soothing steam showers, complimentary refreshments, and exclusive designer toiletries. The hotel’s Le Bar du Boutet is a wonderfully quaint dining establishment that offers a tranquil refuge within which to unwind. And its Décléor Spa is a welcome sight for travelers. Open daily from 9am until 10pm, guests can enjoy the personalized massages and rejuvenating facials that have made Décléor a respected worldwide brand. Nestled within one of Paris’s most historic districts, the Hôtel Paris Bastille Boutet is perfectly situated for its guests to experience the City of Lights. The Rue Faidherbe passes by the hotel, serving as the main thoroughfare through the surrounding 11th arrondissement. As such, guests can easily access the multitude of cultural attractions that proliferate nearby. The historical district of Le Marais is just down the road, which is the home to such iconic landmarks as the breathtaking Place des Vosges. Guests will find other grand destinations, like the Louvre, the Île de la Cité, and perhaps the greatest of them all, the Eiffel Tower. The Hôtel Paris Bastille Boutet is a fabulous place to begin a journey into this illustrious city. 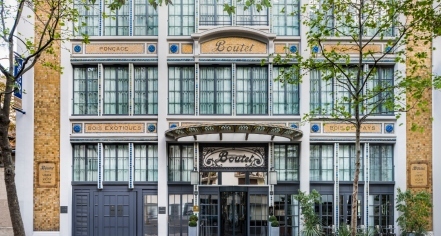 Hôtel Paris Bastille Boutet – MGallery by Sofitel, a member of Historic Hotels Worldwide since 2018, dates back to 1926. From 1944 to 1983, La Suisse Normande produced a wonderful assortment of chocolate candies from the building. The Hôtel Paris Bastille Boutet commemorates this incredible heritage today by selling its very own “Boutet” inspired chocolates. ATM: Located within two minutes walk. Cancellation Policy: Depends on the package or rate booked. Occupancy Restrictions: Two adults maximum per room. Parking: Twenty-eight euros per day. Payment: Visa, MasterCard, Amex, cash and Union Pay are accepted. Pet Policy: Free upon request. 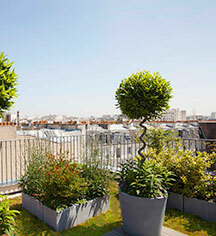 Hôtel Paris Bastille Boutet – MGallery by Sofitel derives its name from a historic Parisian company named Maison Boutet. At the beginning of the 20th century, Maison Boutet was a prosperous business that manufactured and distributed exotic wood to the craftsmen living throughout the surrounding area. Learn more about the History of Hôtel Paris Bastille Boutet - MGallery by Sofitel .